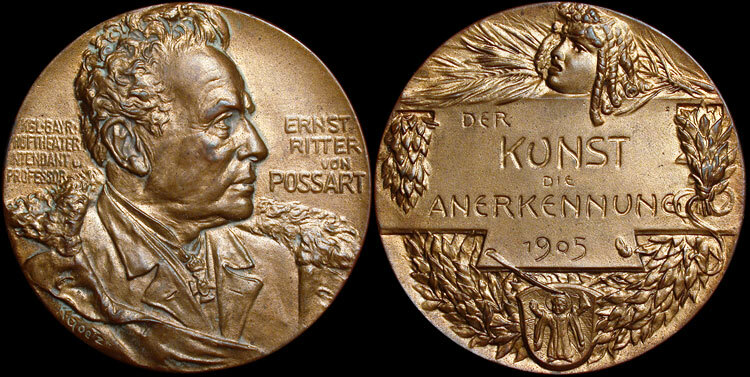 1905 Cast Bronze, Commemorative Medallion, 70.0mm, 149.70g. Obverse: Portrait medal of the General Manager of the Munich Royal Court Theatre 1864-1905, Bust right.. Reverse: His facsimile signature and Munich City seal. Grade: VZ (XF) An excellent example of this early Munich Period piece created shortly after his arrival to Munich. Commissioned by the Royal Court. Overall copper colored patina (evidence that Goetz was experimenting with different recipes to fine tune his signature patina). Over the years we have seen five or six of these with all exhibiting a different color presence.